Lots of companies make vinyl wraps for electronic equipment. Toast does not. They make covers out of thin sheets of real wood—maple, ash, ebony and bamboo. Panels are precision cut with lasers. Optional custom designs are laser-etched. As far as game consoles go, they’ve got models for the Xbox One, One S, PlayStation 4, PS4 Pro and they’ve recently started doing the Nintendo Switch. Standard blank panels for Xboxes and PlayStations are $49, while the smaller Switch covers run $39. Custom designs are $79 for the big consoles and $54 for the tiny one. I approved, and a week later the custom cover arrived. The Squirrel Girl design on top was a little obscured by the grain of the wood, but that’s what you get with wood. Every tree is a singular glorious being, and when you kill it the lines inside look different. The package included the large top panel, nine thin strips to go along the front and sides of the PlayStation 4 Pro and some alcohol wipes to make sure the console isn’t covered in crud before applying the cover. The top panel went on without a fuss, though in retrospect I may have laid it a bit too far forward (there’s a very exposed line of black plastic near the back of the unit). The flexible wooden sheets can be peeled off and reapplied during installation, but they’re meant to stay after they’ve been on for a bit. You can’t take them off and reuse them weeks later. The entire cover is cut from a single piece of wood, so aligning the front top strip was pretty easy. 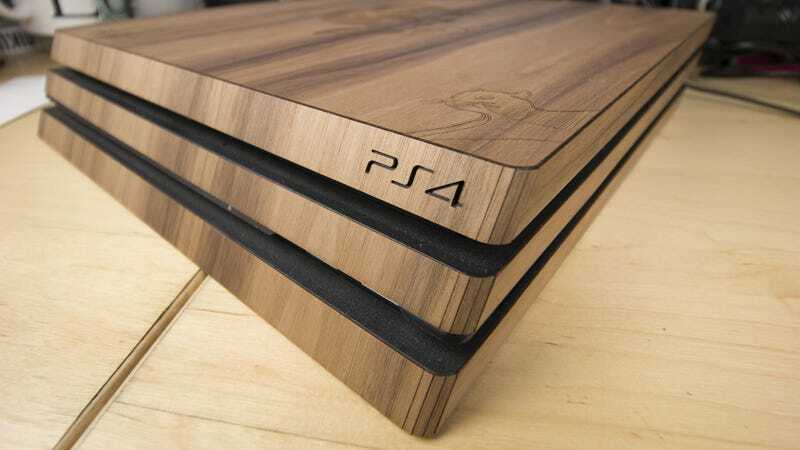 Line up the PS4 logo, line up the wood grain and you’re good to go. In order to maneuver the PS4 Pro’s rounded edges, the strips end with curved and scored bits that wrap around easily. The entire installation took me maybe twenty minutes. The USB ports are still accessible, the buttons still work, and the console’s vents remain unhindered. And now my PlayStation 4 Pro is covered in thin sheets of walnut, and those thin sheets are etched with squirrels and girls thereof. It looks amazing. On a desk covered with wires and blinking lights and a dozen different keyboards, it’s a bastion of squirrely elegance. Well done, Toast. This post dedicated to back corner squirrel, always reaching, never achieving.